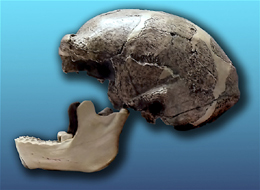 The iconic ancient human fossils from China known as the Peking Man are about 300,000 years older than usually thought, an archaeologist said Thursday. Using a new dating method, a group of Beijing archaeologists concluded in the British journal Nature that the "Peking Man" fossils are about 770,000 years old, beating the previous estimates of 230,000-500,000 years. The new date indicates that "this early human ancestor prospered in an earlier colder climate," Xing Gao, one of the archaeologists from Beijing-based Institute of Vertebrate Paleontology and Pale anthropology, told Xinhua by telephone. "It will lead us to rethink how these early hominins could adapt to the colder environment," Gao said. "Probably it provides further evidence that the early hominins used fire regularly." In an accompanying article in Nature, Russell Ciochon at the University of Iowa, who was not involved in the research, said the study "prompts a rethink of the species' distribution in both the temperate north and equatorial south of east Asia." The Beijing archaeologists said that the study applied an aluminium and beryllium based method to measure quartz samples from Zhoukoudian in the southwestern suburb of Beijing, where the "Peking Man" fossils were discovered in the 1920s. The method works for samples up to at least 3 million years older. The archaeologists highlighted its importance and said they planned to use it to re-measure other Chinese pale anthropology sites. "This is a catalyst for a new era of re-dating," Ciochon said.